This beginner class starts with a spoken introduction to the Lagree Method, the Megaformer and The Studio (MDR), followed by a light workout. INTRO TO (MDR) guides you through the essential Lagree moves while teaching you how to maximize your experience at the studio. This is an instructional class (as opposed to a full class) that gets participants acquainted and comfortable with the workout. We recommend you take this class once to best set yourself up for success. After taking INTRO TO (MDR), clients can take (MDR) ESSENTIALS or (MDR) TOTAL BODY. This 50-minute beginners’ class is devoted to teaching the essential moves that prepare you for (MDR) TOTAL BODY and specialty classes. (MDR) ESSENTIALS consists of a specific sequence of moves that does not change so as to allow the client to master the form needed. This class is best to take after INTRO TO (MDR) so that you feel comfortable with the basic Lagree Method exercises and the Megaformer. This is the most popular (MDR) class creating a strenuous, complete total-body workout. We recommend taking (MDR) TOTAL BODY 3 to 4 times a week with rest days in between. While it's not required, we encourage taking INTRO TO (MDR) and/or (MDR) ESSENTIALS first. (MDR) PRO is designed without modifications (although the client can still make modifications if they choose), challenging not only your muscles but also your mind while elevating your expectations of strength and endurance. With our most experienced instructors leading the way, this is your opportunity to truly unlock your potential and take your training to the next level. (MDR) PRO requires that the client is extremely comfortable with Lagree Method verbiage and the Megaformer. *(PREREQUISTIE) Must have done at least 10 previous (MDR) classes within a month (other Lagree studios do not qualify). No exceptions. Utilizing ballet inspired ideas, flowing poses, changes in tempo, range of motion with a focus on progressive core movements all the while connecting to the breath. All performed on the Megaformer with the purpose of healing, tightening, stretching and strengthening your instrument preparing you for your next (MDR) CLASS. *(PREREQUISITE) Must have done at least 5 previous (MDR) classes within a month (other Lagree studios do not qualify). No exceptions. Everyone wants the perfect bootie. This one-of-a-kind (MDR) specialty class is unlike any other. Specifically designed to target and tone the bum while also burning calories, it provides a serious workout that will whip you into board-short and bikini shape. In between bootie-burning moves are elements of a HIIT (High-Intensity Interval Training) workout that focuses on abs and arms. 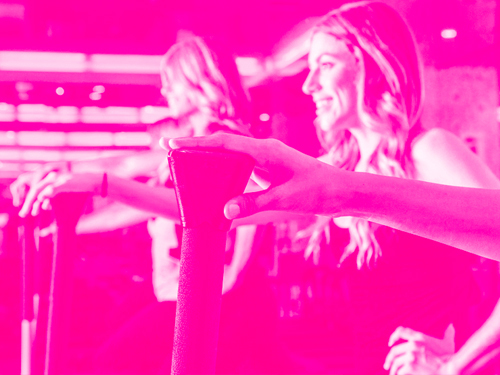 Each class gets you 50 minutes closer to your summer bod. The R&D experience takes everything you've learned at (MDR) and forces you to connect with your mind and body in a brand-new way. This workout is the ultimate total body, mental and physical challenge. This is not a class for beginners. Participants must be extremely comfortable using the entire Megaformer, and while modifications are allowed, they will not be encouraged. *(Advance Requirement) Clients must have taken at least 10 previous (MDR) Total Body classes within a month with instructor Lindsay Hallam (other Lagree studios do not qualify). Email lisa@thestudiomdr.com with any questions. No exceptions. The MegaMamas class is a thoughtfully programmed and balanced class that will place extra emphasis on the arms and legs. It is specifically tailored to expecting mothers, new moms or just busy women. Today's moms are health-conscious and pressed for time. We know that sometimes you can't make it to class, so we tailored this one to be challenging but easily modifiable and supported. This is an abbreviated (MDR) TOTAL BODY. This is a high-intensity, low-impact strength and conditioning class that incorporates specific stretch exercises at the end of class for improved mobility, range of motion and muscle recovery. *(PREREQUISITE) Must have done at least 10 previous (MDR) classes within a month (other Lagree studios do not qualify). No exceptions. Ever take class and think: "my legs are hung over!" We get it. The Studio (MD-ARMS) & ABS is the perfect new class to keep your fitness goals on track while giving your legs time to recover from that killer lunge series. The class focuses on a HIIT (high-intensity interval training) style of workout, getting your heart pumping with the signature core moves and plank variations you have come to love (and hate), followed by arm isolations to help strengthen and tone those signature STUDIO (MD-ARMS.) This class is perfect for those trying to sculpt their upper body and gain core strength, as well as anyone recovering from a leg injury. (PREREQUISTIE): Must have done at least 10 previous (MDR) classes within a month (other Lagree studios do not qualify). No exceptions. Using cutting edge Megaformer core, ab, and lower-back exercises, this class not only shreds your six pack but also increases balance, posture and strengthens the core, preparing you for your next (MDR) class. (ADVANCE REQUIREMENT): Must have done at least 10 previous (MDR) classes within a month (other Lagree studios do not qualify). No exceptions. This class was designed with men in mind, but it's also great for women who want to up their workout. Combining serious strength components with the already Varied Interval Training (VIT) of a traditional total body class, MEGAHUMANS is an opportunity for advanced clients to intensify their workout and leave it all on the Megaformer—literally. Men encouraged, but women are always welcome! *PREREQUISITE: Must have completed at least 10 previous (MDR) classes within a month (other Lagree studios do not qualify).